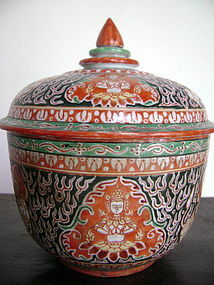 Attractive Sino-Siamese Benjarong Porcelain Jar with original cover depicting Thepanom Angels and mythological Kinarees. Good condition , no cracks, hairlines nor repairs. Size: H. 6.5" (16.5 cm.) x 5.5" (13.5 cm.) top diameter. 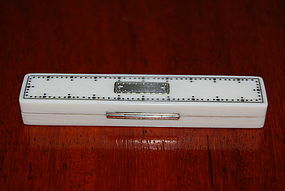 Exquisite and very rare 19th Century European genuine Ivory Pocket or Travel toothpick case. 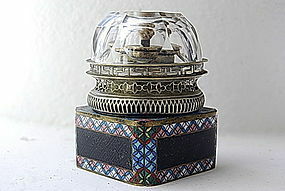 Finely inlaid with silver including dot decor, engraving plate, opening button and hinge. The case does not contain a toothpick. Condition good, except the small mirror inside the case was broken over the years, but could be replaced. Size: L. 8 cm. 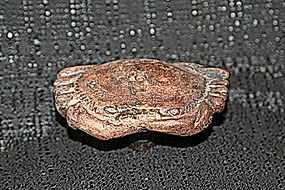 x W. 1.5 cm x H. 1.00 cm. A real collector's find!!! 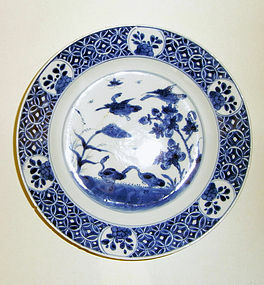 Unusual KANGXI (1662-1722) hand painted blue and white porcelain plate depicting 4 geese (2 in a pond, 2 flying) with plants and insects. The border has 6 flower medallions and a coin pattern. The back side of the plate also has some decor as well as a double Kangxi circle and a mirror symbol inside. Condition: good overall, some inconsequential rim chips/fritting and hairline on the back side. 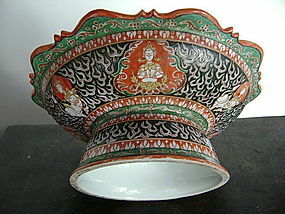 Size: 8 3/4" (21.5 cm.) diameter. 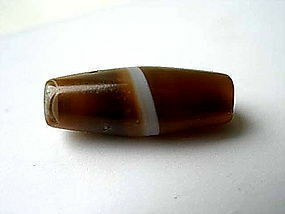 A naturally white banded and tapered caramel-brown agate Dzi Tibetan bead, most likely originally made in India or Central Asia, BC 700 to 200 AD and traded across the Continent. 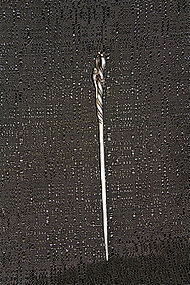 The middle part of the bead is thicker than the tapered ends which gives them a graceful curve. An unobstructed hole runs through the center of this lovely bead. These rare striped beads were considered magical in ancient and present times. Good condition. 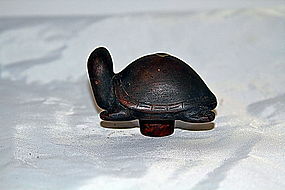 Size: L. 1.9 cm x 0.4 cm diameter. Attractive genuine bronze elephant bell with relief design on both sides and with a clapper inside for a distinct, loud and sonorous sound when in motion. Good condition. Size: W. 10 cm. x H. 8 cm. Comes with an attractive custom made stand! Origin: Burma. 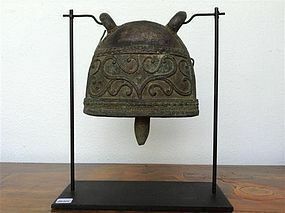 We have numerous other bells in different sizes/designs in stock. Please inquire. Attractive and genuine bronze Elephant Bell with relief design on both sides and a clapper inside for a distinct, loud and sonorous sound when in motion. Good condition. Size: W. 10 cm. 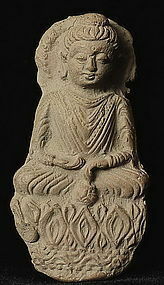 x H. 9 cm. Comes with an attractive custom made stand! 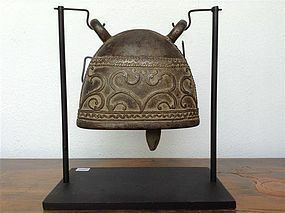 We have numerous other such bells in different sizes/designs in stock. Please inquire. 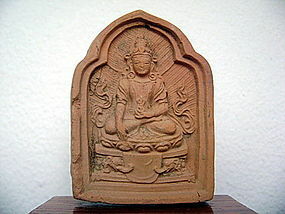 Fine Crowned Bronze Mandalay Buddha in Royal Attire with polychrome inlays and one Red Cabochon Gem in the center of his forehead. Good condition, Size: H. 6" x L. 4" x D. 2.75" (15.2 cm x 10.2 cm x 7 cm. 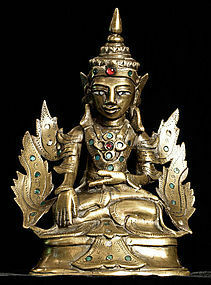 ), Origin: Burma, late 19th Century. Unusual piece! 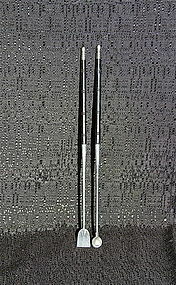 A very fine pair of silver alloy OPIUM tools. 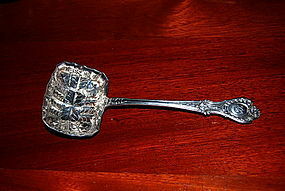 A spoon for forming opium balls and a scraper for kneading and forming opium. The handles are made of Zitan black wood, the mixed metal has a high silver content. A collector's set! Good condition. 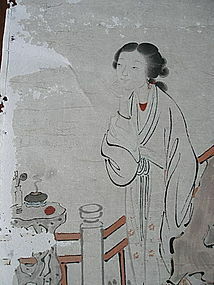 19th Century, China.